This is a picture of the finished FAMILY Chipboard Album project we did over this past weekend, June 7th, as a Father's Day Project (however it can be used for many occasions). Do you believe I didn't do any stamping? I think this is the first project I have done where I didn't stamp a thing. I wanted to demonstrate the Simply Scrappin' Kit and how it alone can be used (with some added accessories, like brads and ribbons) to create beautiful projects. The following posts are shots of individual pages of this album with their recipes (tools and accessories used). What I forgot to mention on many of them is the use of Stampin' Dimensionals to give a raised look to some of the stickers (with brads) and the 1 1/8" and 1 1/16" inch Circle Handheld Punches. Overall, here is a list of Stampin' Up! accessories used for this project. Again, see the following posts for detailed information of each "letter" (page) of the album. Or Purchase the Kit instead! The Kit includes all the materials needed to complete this project (ribbon, brads, rhinestone brads, hodgepodge hardware, and more). The kit allows you to have all the supplies needed for the project at a fraction of the price! For example, instead of purchasing a container of brads, only the number of brads needed for the project would be sent to you. All paper is precut, punched. The only thing you will need to do is trace all the letters and cut them, and then when it is finished to set the eyelets for the binding. The eyelets of course are included in the kit. If you have any questions, feel free to contact me (heather@handstampedbyheather.com)! I had forgotten to purchase enough eyelets for all my customers so there would be 3 on every letter, so I bought them at Michael's for this project ($2.49). However, I would buy them from Stampin' Up! from now on (Jumbo Eyelets - Item #108431, $9.95). Heather, you're album is awesome! That SSK was perfect for this project. Thanks for sharing! Thanks for visiting my site and for commenting! 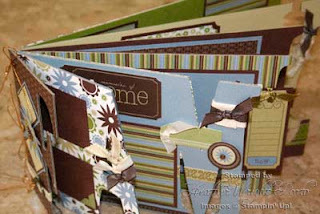 I have begun using the Simply Scrappin' Kits more and more in regards to scrapbooking type of projects. Lots of my customers are traditional scrapbookers and they really like the SSK. I also used Rose Cottage SSK for a Scrapbook in a Day workshop (posted on this blog) - http://heatherporto.blogspot.com/search/label/Scrapbooking and scroll down the page a little to see the 6x6 scrapbooking pages. Heather - What a great album. Love the SSK you used - perfect for this project.